Something you don’t see everyday, a box of flowers is far less expected than a box of chocolates. Healthier too (wink, wink). 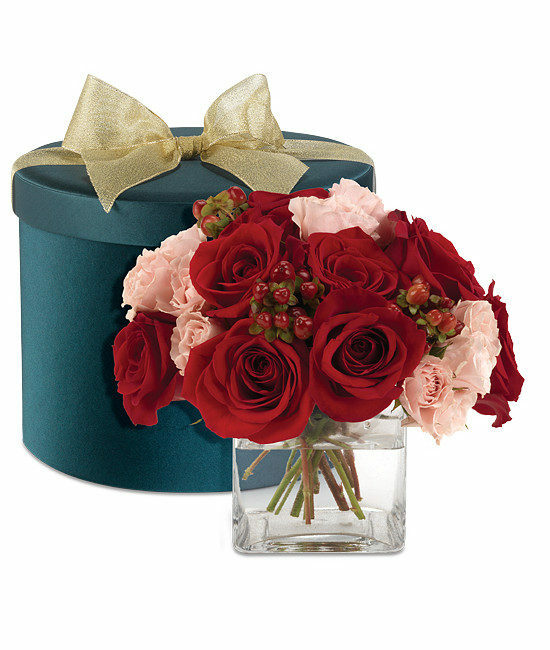 The bouquet features a combination of red Freedom roses, Pink Majolica spray roses and red hypericum berries arranged in our clear square glass vase. 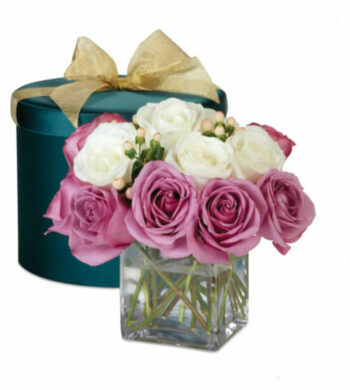 Long after the flowers pass, she’ll love using the silk-covered hatbox to keep cards, letters… accessories. Remove bouquet immediately upon arrival by pulling up on the handles of the insert. Gently lift bouquet from the slotted center. Fill vase ¾ full with warm water and add Calyx flower food. Remove the hydration system from the stems, the foam is a bio-degradable material and can be discarded safely. Keep band around end of bouquet. Trim ½” from bottom of bouquet while holding stems under water, and place immediately in vase. Keep your arrangement away from drafts, direct sunlight and excessive heat or cold. Change water and re-cut the stems every 2-3 days.